Use these activities to help teens discover a new perspective on the Pesach Seder. Teens will learn that storytelling (like we do in Maggid) helps us remember and identify with the story of the Exodus, and also that freedom means the ability to choose to be the person we want to become. Learning Goal: The idea that should be given over is that having the Seder experience year after year shouldn’t be looked at as our own boring and negative “Groundhog day” rather, we should utilize this “Groundhog day experience” to create the most meaningful Seder experience. Question to engage the kids: How many of you feel like Passover is the same boring experience every year? Seems like every year it’s the same family, same questions, same matzah and same corny Passover jokes… We have fallen into what we call the “Jewish Groundhog Day syndrome”… What do we mean by that? Introduce the concept of Groundhog day as a symptom of reliving the same boring experience over and over, by showing the first half of the Groundhog Day Trailer - the part that only shows the sad and annoyed Bill Murray and his negative reaction to living in the same day over and over…. Lesson to take from “Groundhog Day Syndrome”- On Pesach, and in particular, during the Seder, there is a part of us that is Bill Murray’s character in the first half of the movie - that annoyed, bored frustrated person – living in the same boring actions and rituals that we do every year…. We need to get out of that mindset by having fun and finding mean in the Seder experience. The goal now is to transition into Maggid by making it fun, engaging and meaningful, so that we can slowly pull the kids out of this negative "Groundhog Day" mindset - to a fun, interesting and engaging experience - which infuses the Seder with their own personal meaning…. Use life lessons from Ted Talks and the Memory game as a way to show the value of Maggid: Why is storytelling so important? Carmine Gallo in his book, Talk Like Ted, conducted a study of the most-watched Ted Talks in order to try and find if there was a common theme between them. Guess what he found to be the most common theme? The most-viewed Ted Talks had the most personal stories! He goes on to explain that stories are the ultimate avenue to get someone to identify with an idea or a cause… So telling over the story of Maggid isn’t just to make sure we have a history lesson, it is the ultimate avenue to get us to identify with the plight of the Jewish people at the time of their slavery! 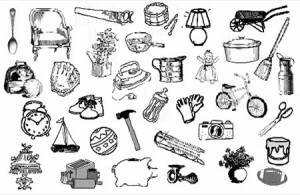 Memory Game: Show the kids an image of 20 items for 30 seconds asking them to remember as many items as possible. After 30 seconds, they have to write down what they remember… you can ask a few to share the images they remembered. Then do the exercise with a new set of images but this time, tell them to tell a story in their minds through the images that they see… after 30 seconds they have to write them down again… usually most of the kids this time around will have remembered a lot more! What’s the difference? The fact that they remembered the images through a story! So we see that storytelling helps us identify and remember what happened in the past…. that is Maggid! Now do an experiential activity to get the kids to tell the story themselves. We had printed the general story of Yitzias Mitzrayim and certain sections of Maggid. We then cut and scrambled the sections. We split the kids into groups and made them unscramble the sections and placing it in proper order. We made a competition that the fastest group to unscramble and put their section in the proper order wins. This got the kids very actively engaged and excited in the telling over of Maggid. After Maggid, we want to help the kids understand what it is to be a slave, before the last step of conceptualizing freedom. Cup Activity: We split the kids into groups and handed out cups – the competition is whoever builds the highest cup pyramid wins! But an advisor has to inspect it to make sure the pyramid is nice and centered… of course - each time we come around to inspect, we knock down the pyramid - the kids are incensed… (That’s the point! They are experiencing the "avodas parech" that the Jews experienced in Mitzraim!) ... So now they have a taste of slavery! Plague Activity: An essential part of the Seder experience is the Ten Plagues. We used this activity (Double Date: 10 Plagues) to go through all ten plagues. It was fun, engaging and meaningful! We asked our advisors to introduce and frame each plague before we played the game. Our final stage is for them to come full-circle by understanding the difference aspects of freedom: Physical freedom vs. Emotional freedom. We show the clip from the Shawshank Redemption to capture physical freedom and explain how our struggle these days in not this as we are physically free – our struggle in to be emotionally free! We capture this idea with the ending clip from the Matrix. Once you show that clip - you explain that the struggle of the “One” is the struggle for us all... we all want to be the best us we can be, but we say “I can’t” or "I’m not good enough" - and we become slaves to our inability to just make that emotional decision within our hearts that we really can realize our potential… Neo (the one) had that slavery within him and in that clip he finally became free, in the sense that he makes the emotional decision that he IS - in fact - the One! That he CAN be the person that lives up to his potential and that the words “I Can’t” are idolatry and don’t apply to him! In that moment Neo finally had his freedom and became the One, simply - because in that moment- he Chose to be the One” The definition of freedom then - is to emotionally choose to be the person we all want to be! We now show the clip of the second half of the Groundhog Day Trailer, which shows a totally different Bill Murray. In this clip, our character is excited, and energized as he has found meaning in the redundancy of his daily routine. He has utilized the fact that he can relive the same experience every day to become the person he always wanted to be. We now come full circle to explain why the Seder can be the best Groundhog Day experience of the year: As long as we are the second Bill Murray - the character that infuses their Groundhog Seder experience with meaning and fun - then it won’t be us reliving the same boring ritual as last year, rather, it can be the ultimate tool and conduit for us to realize our potential.